Product Description Forever Firm. Blissful slumber is just minutes away with the Blue 300 firm Queen mattress set. Though firm, this mattress utilizes the benefits of memory foam to provide unwavering support, resulting in heavenly sleep you never thought possible. Forget cracking a window or turning the fan on, state-of-the-art TempActiv™ Gel Memory Foam infused with cooling beads absorbs and dissipates excess heat. That’s not all! The EverCool® Fuze Gel Memory Foam enhances breathability to promote airflow and further reduce heat buildup. This combines with Deep Reaction™ Memory Foam to hug every curve of your body and create an extremely comfortable, plush feel. 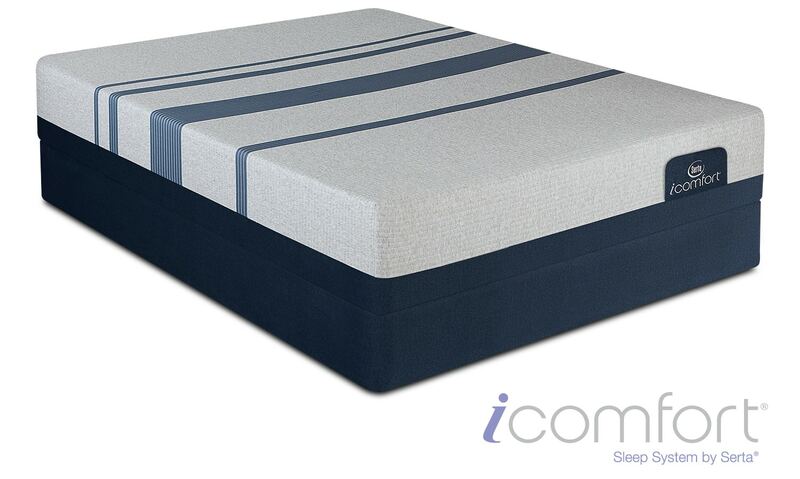 Unique Features: TempActiv™ Touch Fabric Technology and Max Gel Memory Foam wick heat away for a constant cool sleeping temperature.